In November 2012 and again in June 2013, Elsevier launched a program to support young scholars in between jobs or looking for their first postdoctoral position. Applicants who qualified were granted up to six months free access to all our journals and books on ScienceDirect and were able to use this access to work on grant applications and research projects. We were delighted with the response, both from postdoctoral organizations who forwarded the application form link and from researchers who qualified for the free access. As a postdoc fellow in biological sciences, this program (gave) me the chance to maintain a vital scientific network, to read papers and write grants. In the absence of help from government and local institutions, the Elsevier program was a great experience, an innovative way to support postdocs during their research career. As the international economic situation continues to be challenging for scientists starting their career, we have decided to bring back this program. In order to give even more people the option to apply, we have extended the application period to six months. To qualify, candidates must complete a form verifying their credentials by August 31, 2014. Once approved, they will receive a personal code allowing access to ScienceDirect. Postdoctoral researchers who have received their PhD within the past five years. Candidates must have completed their last research position (either PhD research or a postdoc or equivalent) on or after January 1, 2014, or have a position that will end before August 31, 2014. Gaelle Hull is a Marketing Communications Manager at Elsevier. I will complete my Phd by this month, thereafter unemployed :-( can I get free access even without having any postdoc position? Yes, this program is available for people who have just completed their PhD. Just fill in the form at http://about.elsevier.com/host/formpostdocfreepassport.html and we'll take it from there. Thank you for telling us about your situation. I will make sure the organizers of the program see your comment. Can you set up similar program for those are doing PhD or even to those might want to do it. Thank you for your comment. I will make sure the organizers of the program see it. It is a wonderful project. I would love to join. I thank you so much for this opportunity. I will apply for it after my graduation. That's wonderful, Sylvia. Good luck to you! I had completed my PhD on Sept. 2012. Now doing Post doctorate, am I eligible to get ELSVIER free Access? i have MD in histology but at 2007. can i submit for the free access program or not. many thanks for El Elsevier. 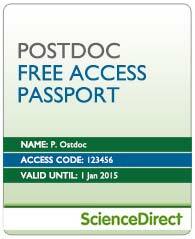 I would like to get the free access as I have competed my PhD two years back and am yet to join a job. It looks like you might qualify. Here's a link to more information and the application form. I have finished my PhD on10th of March 2013 and I started my postdoc on 5th of January 2014 and It takes one year, can I get the free access? Congratulations on your postdoc position. This program is for researchers who don't have positions. Since you do, you can probably get access to ScienceDirect through your institution. • I have become unemployed after 1 January 2014, or have a project ending before 31st August 2014. • Must have completed your last research position (either your PhD research or a postdoc or equivalent) by 1 January 2014 or have a position that will be completed before 31st August 2014. I finished my doctoral degree in basic medical science ,parasitology 2008 and I am trying to publish reasearch papers...can I get this free acess? I completed my PhD in April 2013. Now i am working as Lab Supervisor With Intertek India Pvt. Ltd.. Can I get free access?